I keep meaning to do more of these, but time always seems to find a way to slip past me, and I love Coombe Mill’s website, so I’ve finally managed another Country Kids post. 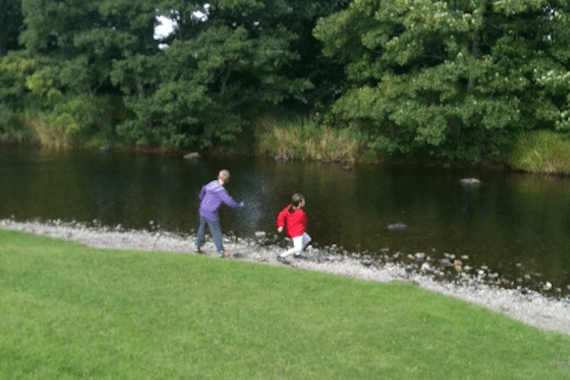 We had a drive through to Huntly and the river Deveron at the weekend, and the kids spent ages skimming stones on the river. The photos are from my old iPhone 3GS so you really do have to forgive the lack of quality, but hey, it was a weekend away, so I guess that means I was allowed to relax the good photo rules. 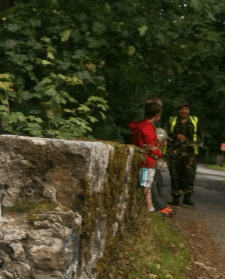 So, where do the Army Cadets come in. Needless to say, I’ve requested the information about the battalions in Aberdeen and there are several to choose from, so one of mine might get a chance at getting his hand on a gun and marching in time. It certainly will mean getting involved, plenty of activities and some face paint and guns. Discipline will also be at the front of it all, and respect for others. What’s not to love for a boy by doing it, and the benefits for me as a parent could be quite high? It’s actually quite refreshing not to always see posed pictures, which is why I like reading blogs so much. The cadets sounds like it will be fun. I wish them all the best in their new adventures. Ooh good luck for him for next week. I hope he enjoys it. Let me know. Wow, my boys would have been just the same in awe of those Cadets in their uniform! They are all in the scouting movement but this is one I had not thought of. I think they have sea cadets here, I may have to look into it. A perfect Country Kids post and good for you taking time off, the pictures tell it all and I rather like the soft focus! I’ve checked it out today, and there are Sea Cadets from the age of 10, Air Cadets from 13, and the Army Cadets are from age 12. Mind are busy poring over the websites at the moment, to see which ones they would prefer to join. I think they’re hooked by the military draw (and the promise of yearly manoeuvres).